As the new proprietor of Webb's Glass Shop, Savannah has been appointed to fill her late father's shoes as a judge for the Spinnaker Arts Festival, held in downtown St. Petersburg, Florida. With her innovative glass works, the clear winner is Megan Loyola, a student of Savannah's former mentor. I received a copy in exchange for an honest review The first book was enjoyable enough that I decided to give the second book a try and I have to say I enjoyed this one a lot more. I got more of a feel for the characters and as I already knew everyone I got easier into this book. I had a lot of fun reading this book and finished it in a few days. The pace was well done and enough things happened to keep me interested. The ending did feel a bit rushed though and things suddenly got wrapped up very quickly. There's a plot line surrounding Rooney that didn't got wrapped up and I was a bit disappointed about that as I enjoyed that sub plot. The mystery was very well done, up until the end. There were lots of clues and investigating and things happening and changing. It was a bit unbelievable how Savannah did her own investigation and the police was more or less okay with it, but I didn't mind too much as I did enjoy how much she was involved with solving the mystery and it made for an interesting read. I liked how they kept track of everything and also kept the reader updated that way on all the latest developments. I didn't guess who the murderer was and it was a nice twist at the end, but I also thought there could've been a few more hints in that direction. Looking back there are a few small hints, but I would've liked a bit more. But overall the mystery was written very engaging. I am enjoying reading more about the glass shop and glass making, it's interesting and adds a fun touch to the book. Savannah is also developing the glass shop more, branching out in new directions and I liked seeing how Amanda found her place working in the shop as well. I did feel like sometimes there was a bit too much focus on the mystery and I wondered if they got any work done at all and we don't really see where Jacob is working on besides the mystery. I got a bit more of a feel for the characters in this book and I liked the subplot involving Rooney, Savannah her puppy and how she trained him. Then there is her relationship with the side characters, mostly Jacob, Amanda and Edward, and how they all work together to solve the mystery. I felt like I got a bit more of a feel for their personalities in this book. There are also some new characters we meet and I liked the art festival plot line and how the murder tied around that. It did bother me a bit that Savannah hid something from her friends as I thought that was a bit unnecessary. There's a hint of a romance, but Savannah keeps saying she isn't ready for a relationship. And suddenly at the end it jumps forward, which seemed a bit rushed, just like the whole ending. I would've liked to see it explored a bit more instead of going from a hint to more in hardly any time at al. To summarize: I really enjoyed this book and thought it was better than the first book. I felt like I got easier into this book and I enjoyed the strong focus on the mystery, while it might have been a bit unbelievable at times I really enjoyed it. The mystery moves along nicely, with enough progress and updates on the progress. It kept my attention and I finished this book in a few days. The characters got a bit more developed in this book I liked seeing the four of them work together to solve the mystery. There are also some new side characters we meet. And there's a hint of romance, that at the end suddenly seems to turn into more, which felt a bit rushed, but we'll see how that continues in the next book. The ending and how the mystery got wrapped up also felt a bit rushed, but overall this was a great sequel and I am looking forward to the next book in this series. Author Cheryl Hollon is a glass works enthusiast who shares her knowledge through her character,Savannah Webb. She is also a skilled cozy mystery writer giving her readers a great group of characters who form Savannah's murder and crime solving posse. When Savannah is asked to take on the Spinnaker Arts Festival's glass competition judge position, she finds herself relying on her former teacher Keith for guidance. Awarding Best In Show was a tough decision of Megan's 'Fire' over Leon's 'Ice' but when Megan fails to claim her prize, then turns up dead, Savannah becomes the prime suspect in Det. Parker's investigation. Training her dad's Weimaraner, Rooney, takes a lot of energy and time but the puppy's devotion to Savannah as she works with him in agility training gives us another interesting area of knowledge. I did guess who the murder was early on in the book but there were enough twists and turns that at points I had my doubts. Looking forward to book 3! I was once again immediately taken with this story. As with the first book, I loved being immersed in the glass making business in this story, although I feel there was less of seeing the glass making side of the business in this book than in the first book. But with that being said I really enjoyed this story. The plot itself was well developed and interesting. I pegged the "who done it" almost from the beginning, even if I didn't get the "why" part correct! But even after guessing who the actual murderer was I found myself second-guessing that many times throughout the story, as there were many twists and turns in the story, leading to an enjoyable read. I loved seeing the characters of Savannah, Amanda and Edward grow in this book and I saw them become much more rounded and complex! And can we just talk about the cover? Another simply beautiful cover design! I was right when I said that Mrs. Hollon has a hit on her hands, this mystery series is awesome! I can't wait for the third book, Cracked to Death, to come out on June 28th, 2016! Overall, Shards of Murder was another fun addition to the Webb's Glass Shop Mystery series. It was a fast read with an enjoyable, original story line. I received an ARC of this book, from NetGalley, in exchange for my honest review. 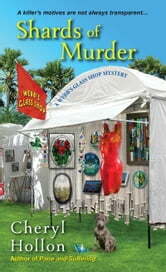 Shards of Murder by Cheryl Hollon is the second book in A Webb's Glass Shop Mystery. Savannah Webb has been to be a judge at the Spinnaker Art Festival (glass category, of course). It is an honor to picked. Savannah is a little nervous as this is her first time judging a competition. Her former mentor (and teacher), Keith Irving is in town. Keith has two students entered into the competition (Megan Loyola and Leon Price). When the winner does not arrive at the award ceremony the next day, Savannah goes looking for her. Savannah finds an empty booth. However, when Savannah is out walking Rooney (her Weimaraner puppy) she discovers a body in the water (in Tampa Bay) with a shard of glass in her head. Someone wanted this person dead. Savannah is the last person to see the victim alive (which means she is a suspect). Savannah and her posse gather together to find the killer (and the motive behind the killing). Will Savannah be able to find the killer before she ends up in the bay. Shards of Murder was a cute and fun story to read. I like the characters and the setting as well as the beautiful descriptions of glass as the festival. I especially like learning about different methods of working with glass (this time about fusing glass which I find fascinating). The mystery was extremely easy to solve (I guessed it immediately), but I liked the authors misdirection and clues. I give Shards of Murder 4 out of 5 stars (I liked it). I found Shards of Murder just as good as the first book in A Webb’s Glass Shop Mystery, and I cannot wait to read the next book in this series. I received a complimentary copy of Shards of Murder from NetGalley in exchange for an honest review. It's not often that Florida has a story set outside of either Miami or Orlando. That this one is set in St. Petersburg, known locally as St. Pete, makes it unique. St. Pete is an eclectic little spot, with so many different cultures having helped to build and develop the area. As a Florida native, who lives just 2 hours away, it was a real pleasure to read someone doing the city justice and getting it right. Sometimes a city is described so accurately, that it's rhythms and vibe can be likened to another character in a book. The author manages this nicely for St. Petersburg. I was a little concerned after reading the first book, Pane and Suffering, that the author wouldn't be able to meet the high standards she set in the first book. I am pleased to announce that she did an excellent job of not only meeting them, but exceeding them. Savannah and her posse are really coming together as quite the enterprising group. Though the story is told mainly through Savannah, the story has an ensemble feel. They utilized their individual strengths to work together to solve the murder quickly, much to Detective Parker's annoyance. If you want to read a cozy mystery that's more than just a niche book, this series would be a perfect fit. It's so much more than just about glass making, though that does play a large part. I had a hard time putting this book down, and gave it 4 stars. Thanks to Netgalley, Kensington and Great Escapes for the opportunity to read and review this book.